Statistics prove that the way consumers shop for cars is changing and changing quickly. In 2012, consumers went to an average of 5.4 dealerships before making a decision. That number of dealership visits dropped to 1.2 in 2017. Additionally, 82% of consumers buy a car at the very first dealership they walk into: this means more and more research is being done online prior to a consumer stepping foot in a store. As a dealer, you need to pay as much attention to your online presence as you do to your offline presence in the showroom. It’s clear that buyers are making their decisions in the digital showroom, so what can you do to improve yours? Focus on your low funnel by following photo and UI/UX design best practices while building accountability into the merchandising framework is key. Once you maximize and improve that lower funnel, you’ll get more dollars out of the other levels in your funnel. Measure your input numbers like unique visitors, VDP visitors, lead submissions, etc. and compare them to your outputs like VDP unique visitors, lead submissions per VDP visitor, and other conversions. 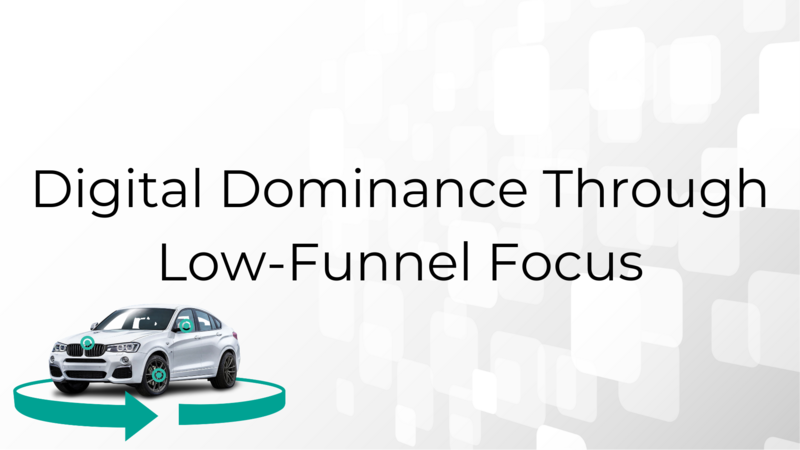 As a dealer, it’s important to quantitatively measure and analyze KPIs that matter to your low funnel. Shoot vehicles in a consistent format. Ensure value-added features are captured using dynamic photo prompts. Get vehicles online fast to reduce missed opportunities. Leverage manual camera controls to improve photo quality. Use blur to minimize distractions in the photo. Get important vehicle details above the fold. Display features in an interactive fashion. Use scarcity to create urgency. Employ a sophisticated recommendation engine. Use high-res zoom and pan photographs. Consider alternate mediums for mobile browsing. Building accountability into the merchandising process is another way to ensure your digital showroom is performing sufficiently. There’s a massive ROI when you get cars ready to sell quickly. It can cost $54 a day for every day of delay in getting a car online. Try doing the math on that when you’ve got multiple cars taking several days to be ready to sell. So how do we fix this? Establish a clear reporting path. Set goals for merchandising like days to market or cars shot per day. Consider putting incentives in place for stretch goal attainment. Schedule daily stand up meetings. It’s also helpful to keep tabs on merchandising and market trends that you can capitalize on and use effectively. Studying merchandising trends will allow you to utilize user data in your sales process. How much time did a consumer spend looking at certain features like the performance features like the engine? How about safety features? The BDC department can leverage consumer behavior data with potential buyers in the middle funnel. Marketing trends like virtual reality tools that are growing in popularity are another great way to improve VDPs. Using interactive tools that put consumers in control, one could say in the driver's seat, is something that will have a considerable positive impact on dealer’s sites. Implement an effective measurement system to track the performance level of your low-funnel. Shoot photos consistently and use a shot guide. Get vehicles online fast using wireless upload. Use high-res photos and an urgency counter to easily lift conversion. Leverage user browsing data in your BDC. Finally, take a look at your own website from a mobile device and ask yourself a few questions about the user experience as if you were a consumer. Is it responsive? Is it easy to navigate or is it frustrating to find features and details? Each VDP needs details to not only differentiate vehicles, but to stand out from other dealer sites. Do these things, and you’ll see that dominating the digital landscape will allow you to further dominate in your physical showroom. If you want your online showroom to thrive, take a demo of SpinCar’s Mobile Capture App to learn how you can increase photographer efficiency, improve turn rate, and boost on-site engagement.